Progressive Industries 30-50 and 50-30 adapters provide superior durability and heat resistance over "dog bone" type adapters. Unlike “dog-bone” type adapters, no cable is used, therefore eliminating cable separation. Made of high heat, impact-resistant plastic and heavy-duty highly conductive metal contacts. This adapter greatly improves heat and dissipation and conductivity. With a solid ground pin, ground connection is improved for added safety, while the molded-in-finger grips makes disconnecting easier. 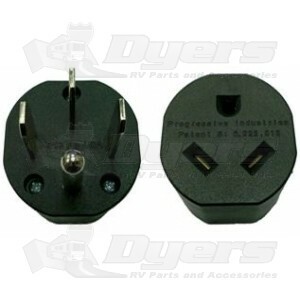 Adapts 30A RV Plug to 50A RV Plug. Weather resistant / for outdoor use.